If the Mz3 book is finished or should it be tested “life”, the respective “Package” is generated with the help of this menu item. First of all, everything is updated again (the same function is actually used, which can also be called via Commands – Update. In a “Package” all programs, configuration data, elements, settings, etc., which are required for the display of the book, summarized. 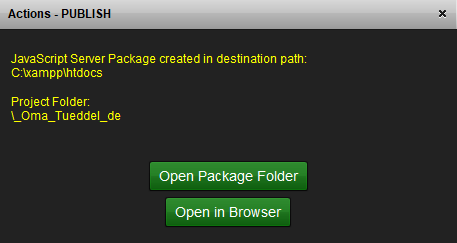 Since MegaZine3 can be used in 3 different program versions, 3 different “packages” can be created. The program variant can be selected via “radio buttons” in the upper area. 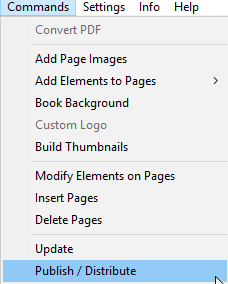 Above the “Publish” button it is summarized which elements are used for the book. It is thus possible to check at a glance whether this is in line with expectations. The progress is displayed as usual in the status window. Depending on the size and content of the book, this may take a few seconds. 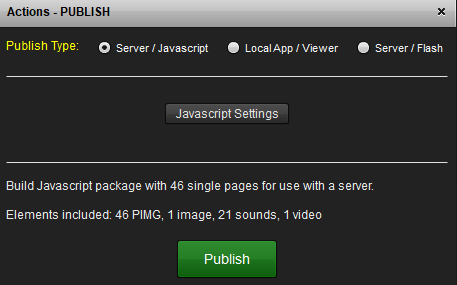 In the next step, everything will be uploaded to your own online server (see Server Upload). Alternatively, you can click on the “Open in Browser” button: The standard browser opens and accesses the local XAMPP server (see Local server). Anyone can download this free program from our website and install it locally. There is the viewer as “Windows 10”: https: //www.megazine3.de/downloads/mz3v242/demoViewer.msi and “MAC OSx variant”: https: //www.megazine3.de/downloads/mz3v242/demoViewer. pkg. The Android and iOS version we have currently put on hold. The performance did not convince us. Meanwhile, smartphones should have caught up vigorously in terms of computing power and it would possibly be worth trying again. All data needed by the mz3Viewer is available as a normal ZIP file after the “Publish”. For the mz3Viewer to know that this is “his” file format, mz3Viewer packages have the file name extension “.Mz3z”. But you can rename the file and use “.zip”, and then unzipping the file with each de-patcher we use 7Zip or winZIP. For the last two options (2 and 3) as well as calling “COmmands – Open in Viewer”, the mz3Viewer program must be linked to the file extension “.mz3z”.